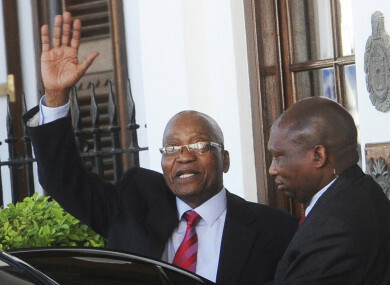 South African President Jacob Zuma waves as he leaves parliament in Cape Town (File photo). SOUTH AFRICA’S RULING ANC party has resolved to oust scandal-tainted President Jacob Zuma from office after he refused to resign, local media reported following marathon closed-door talks. ANC officials were not reachable to confirm the reports, but the party called a press conference for 12 pm (10 am Irish time) at its headquarters in Johannesburg. We know you want closure… Because our people want this matter to be finalised, the NEC will be doing precisely that. South African opposition parties yesterday called for early elections as the ANC’s leadership battle ground on. The ANC has insisted there will be no delay to the budget speech, which is due on 21 February. Sunday’s rally was part of ANC celebrations marking 100 years since Nelson Mandela’s birth – as well as efforts by Ramaphosa to revive the party’s tainted reputation ahead of next year’s general election. Zuma (75) has not spoken publicly since 4 February when he was first asked by the party top leadership to step down. Under Zuma, the ANC won less than 54% of the vote in local elections in 2016 – its worst electoral performance since coming to power with Mandela at the helm in 1994. Email “South Africa's ruling party has decided to oust scandal-tainted President Zuma - reports”. Feedback on “South Africa's ruling party has decided to oust scandal-tainted President Zuma - reports”.